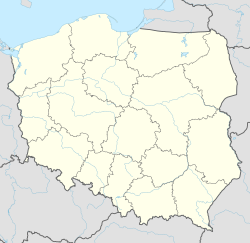 Dzierzgoń [ˈd͡ʑeʐɡɔɲ] (German: Christburg) is a town in the Pomeranian Voivodeship in Poland. It is located in Sztum County east of Malbork and south of Elbląg on the river Dzierzgoń. Dzierzgoń has a population of 5,800, while the city and its environs have a combined population of 10,000. Altes und neues Preussen, Christoph Hartknoch. The city was originally a settlement of Old Prussian tribe of Pomesanians. In 1247, a castle known as Neu Christburg (German for "New Castle of Christ") was founded overlooking the Sorge River (Dzierzgoń), a few kilometers away from an older fortress known as Alt Christburg (Stary Dzierzgoń) by Teutonic Knights brought to Poland by Konrad Mazowiecki. In 1249 a peace treaty was signed at the new castle between the victorious Teutonic Order and defeated local Old Prussians. In 1254, the town which had developed near the castle was first referred to as Christburg. Within the Monastic State of the Teutonic Order, Christburg was an administrative seat for the regional Komtur. After the Second Peace of Thorn (1466), Christburg became part of the Polish province of Royal Prussia and was officially named Dzierzgoń in the documents. From 1508 the city was renamed to Kiszpork In 1772 it was annexed by the Kingdom of Prussia during the First Partition of Poland and was incorporated into the new province of West Prussia. Christburg became part of the German Empire upon its foundation in 1871 during the unification of Germany. Around 1900 Christburg had one Protestant church, two Catholic churches, a synagogue, a county court, a brewery and a dairy. Until 1919 Christburg belonged to the administrative district of Regierungsbezirk Marienwerder in the German Province of West Prussia. In 1920, after World War I and the reestablishment of independent Poland, a plebiscite was held to determine whether the region would be part of Germany or Poland. In the town 2,571 inhabitants voted to remain in Weimar German East Prussia, 13 votes supported Poland, thus the town remained part of Germany. Over the time span 1919–39 Christburg belonged to the administrative district of Regierungsbezirk Westpreußen in the Province of East Prussia, and from 26 October 1939 until 1945 to Regierungsbezirk Marienwerder in the new province of Reichsgau Danzig-West Prussia. After World War II ended in 1945, became part of Poland as Dzierzgoń, based on an Old Prussian Zirgūni name. The German population either evacuated during the war or was subsequently expelled afterward. The town was resettled by Poles from Polish areas annexed by the Soviet Union and Ukrainians expelled from southeast Poland in 1947. The former Roman Catholic Cloister is now a Ukrainian Eastern Rite Catholic Church. ^ a b Meyers Großes Konversations-Lexikon, 6th edition, Vol. 4, Leipzig and Vienna 1908, p. 102. ^ a b Johann Friedrich Goldbeck: Volständige Topographie des Königreichs Preussen. Part II: Topographie von West-Preussen, Marienwerder 1789, pp. 19–20. ^ Der Große Brockhaus, 15th edition, Vol. 4, Leipzig 1929, pp. 96–97. ^ Brockhaus' Konversations-Lexikon, 14th edition, Vol. 4, Berlin and Vienna 1998, p. 272. ^ Michael Rademacher: Deutsche Verwaltungsgeschichte Provinz Westpreußen, Kreis Stuhm (2006). ^ August Eduard Preuß: Preußische Landes- und Volkskunde. Königsberg 1835, p. 445, no. 60. Wikimedia Commons has media related to Dzierzgoń. This page was last edited on 28 October 2018, at 15:29 (UTC).